The US’S Galactic Cowboys have been around since 89′, disbanded in the year 2000, and a good way to describe their style would be, fitting with the title – in your f*cking face! 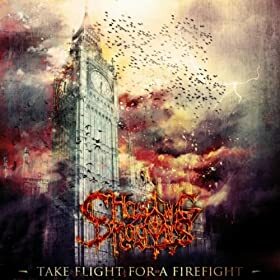 Though you’ve probably never heard of “Space In Your Face“, ‘chances are this one will appeal to you on multiple levels if you are a fan of any of thrash metal’s top bands(and for your sake, your are!). These Texans’ music is heavy enough, alternative, intelligent(for the most part) and has a kind of southern grungy guitar-driven attitude with a bit of an 80’s\90’s vibe that kills. Does that sound extremely general to you? 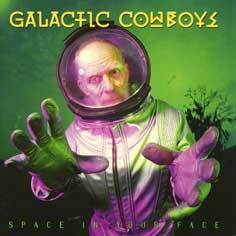 Well that’s ’cause the Galactic Cowboys channel tons of stuff on “Space In Your Face“, from thrash to melodic hard rock and they also got a softer clean\bluesy side to’em. 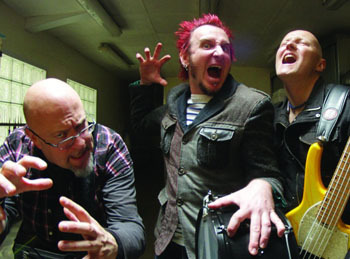 Regarding the tracks themselves, these include solos, gang vocals, kickass riffs – the works! Sure you could say all that has been done already, but the band brings a different, refreshing energy into their songs, making those, if not the most original, still totally catchy &memorable. Things feel organic but at the same time very thought through, and work for the boys especially on “You Make Me Smile” and “If I Were A Killer“, the latter having a simple but smart lyrical concept; It’s heavy but fun music, melodic but to the point, not overstaying its welcome. Far from being a perfect release, “Space In Your Face” does have its weaker tracks. The group, I’m unsure why, decided to take their newfound 80’s attitude too far on pieces like “Blind” and “About Mrs. Leslie” – the whole album suddenly stopping its addictive rhythm and getting into a plodding pace, everything dragging slow and safe. It’s like listening to Kill’em All with a bit of The Black Album in the middle; Now that’s plain WEIRD, if not cringe-inducing. Luckily, following this tiring business the guys get back on track with some interesting hard-hitting closing material with “Still Life Of Peace“, making the listen overall pretty worthwhile. Released in 2011, this brainchild of guitar player Christophe Godin and his talented band is a freak of an album. Seriously! just look at that cover art and tell me it’s not completely ridiculous! Yes, it’s a floating plastic thingy holding a fork and a knife. I’m weirded out too! Gno, as you see, don’t take their image too seriously – but that makes sense if you think about it! Godin, after all, is an already recognized virtuoso; a modern guitar hero who toured with guys like Paul Gilbert and Frank Gambale. He doesn’t really need to prove himself by recording another shredfest, which(my guess) is why “Cannibal Tango” is actually a straight-forward, fun-packed Metal\hard rock album. Oh, but don’t worry! these crazy Frenchmen do a very sneaky, smart thing by giving this mainstream feel-good effort a superb edge of high-end heavy metal, and flavor it with stunning outbursts of different musical styles. You sneaky, sneaky Frenchmen! I told you they’re sneaky! “Cannibal Tango” starts with “Here I stand” – which my favorite track on the album. It has a killer main riff that beckons you to headbang with that deep groove metal tone, down tuned and pissed off.. It screams BADASS! but it also has a funky side a la Mr. Bungle. Now you know why it’s my fave. The vocalist is..not so bad really, but more importantly, the other band members add a lot of vocal harmonies, and together they make every chorus win your ears & heart like a 80’s heavy metal record. Really, it’s damn impressive. “In My Place” has a reggae verse and a pure hard rock chorus. Again the track is short and to the spot, and when that solo arrives you know you don’t wanna mess with this Christophe guy. “The Keeper” colors itself differently by emphasizing more on a middle-eastern scale, and contains stronger shred moments. Everything is mixed great as usual, the vocal phrasing is just awesome, and these things make every track worthwhile! 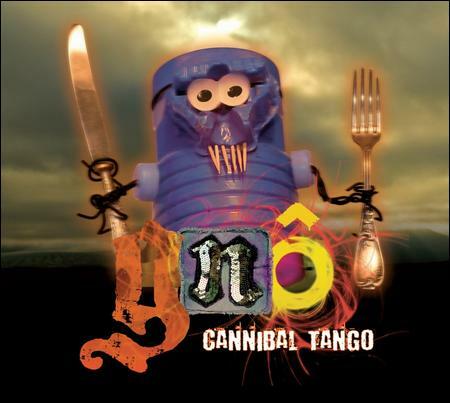 Even the title track “Cannibal Tango“, which I personally find creepy and cliche` to an annoying degree, works, because these guys are pros. While perhaps too lengthy, all in all this is definitely a good, surprising and uplifting record that can be appreciated by hard rock & metal fans alike. Even random people with a sense of humor and a bit of a musical taste should be able to enjoy it! Guitar-wise, Godin takes inspiration from so many heavy metal styles and these merge together great, making it insane to try and discuss their individual qualities!.. which is not so great when reviewing music eh? haha. “Fever“, “Hate Incarnate“, “Get Out Of My Way“; Everything here is refreshing yet oldschool – it’s the best of both worlds. You can have your cake and eat it too, with a fork and a spoon. *Stares again at cover art*; What in hell’s name *is* that thing really!? I’ve recently come across Royal Thunder, who play the kind of music you could easily label Desert Rock; Bluesy, “strong but tender” Southern US material. I was especially impressed with their 2010 track, “Mouth of Fire”. Besides being awesome, a curious thing about this song is this: It somehow doesnt represent the band’s self-titled album at all! Click play and read on for the explanation. listening to this piece makes you immediately recall the good old days ol’ Black Sabbath. Its got *that* riff – the one that just grabs you like a lost memory, finally found; A surge of oldschool energy and melody going through your mind. Its a great song and the vocals fit it beautifully, but naturally, it also makes you expect the rest of the album to continue in the same tradition..aaaaand, well.. that just doesn’t happen! Let me tell you, this has left me quite confused. Though I am totally for genre-merging, if you ever though Desert Rock and Stoner\Heavy Metal are close genres, this example might change your mind. After “Mouth of War”, the rest of the tracks really drop in stamina, turning into a very mellow record. The thing is, Heavy Metal can too be mellow, but it is always filled with high energy and drive, and that is mostly unfound here. I’m not saying this album(again, self titled) is bad, just don’t expect it to be a Stoner Metal release. Letting go of that expectation has actually made the album quite enjoyable for me, once I gave it a second listen. If you like classic Desert Rock you can check the rest of the band’s material on their Bandcamp page. Chasing Dragons is a hard-rocking heavy metal band which combines the oldschool and the modern, their latest release featuring impressive guitar playing and a great female vocalist! As you will hear, this release is obviously more mainstream-intended than the usual underrated favorite, but damn, its been a long time since I’ve heard such consistently tasteful guitarwork; heavy riffs, solos and twin guitar leads charge you at every turn in this record, rendering you effectively deaf to its flaws. Its very catchy music which some might call “pop” or metal, yet the band never holds back on the heaviness, making them a great recommendation and one which can appeal both to 80’s\light hard rock fans, modern melodic metal kids, and the old’ heavy metal crowd. Let me confess – this type of melodic metal is not usually my thing nowadays, but the material here is so energetic and focused it just grabbed me. Take note that this is only Chasing Dragons‘ first release ; their future looks burning bright, and if you happen to be a melodic metal fan, this gem of an album is definitely worth your time! The only thing I don’t get about this release, is the artwork..its really nice, but made me think this is gonna be some Vampiric DM thing actually, haha!